We all know that packing your lunch will save you loads of money. All you need is a little planning and time. 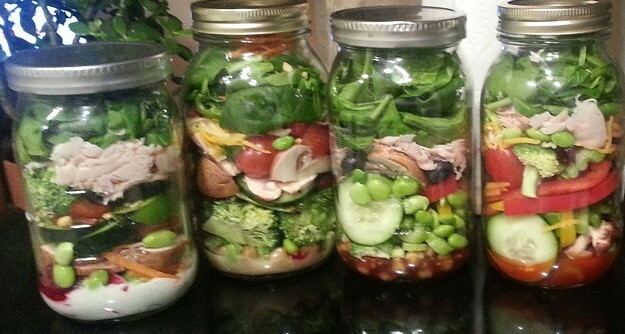 As you can see above, I love to create salads in a jar, personalized to my taste. 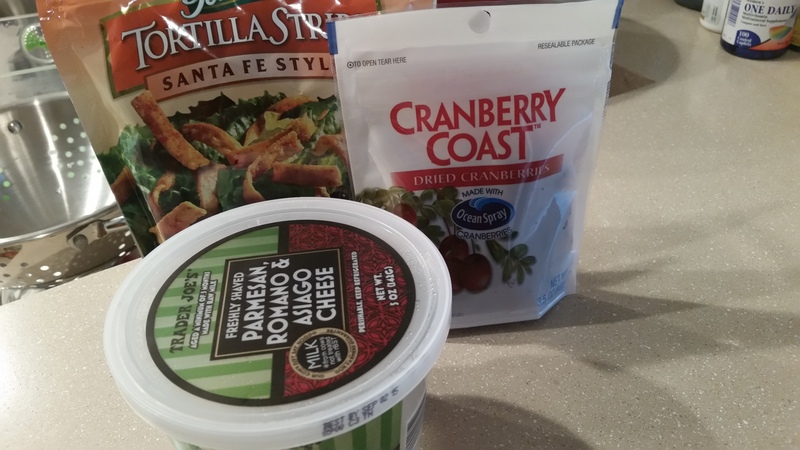 On Sunday evenings, I used to make my salads for the week. The plan worked out great for several months, and then my weekend schedule got busy and making four to five salads at a once became time consuming. Shopping for ingredients, prepping the veggies, and filling the jars takes a lot of work. Also, I became bored with eating a salad nearly everyday for lunch, so I modified my system, making it quicker and easier. First of all, I only use two mason jars per week. 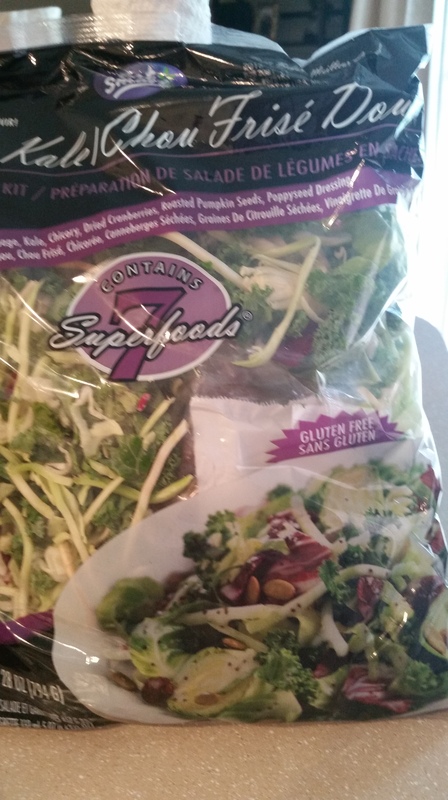 I also make a third salad, but I put it in a plastic salad container since I will eat that salad on Monday and it doesn’t need to go in a jar to stay fresh. So my system cuts my salads down from five to three salads a week. On the other days, I make sandwiches, eat soup or leftovers, and sometimes I buy my lunch on Friday. This adds some variety to my lunches. What size mason jar do I use? A quart size/32 ounces. 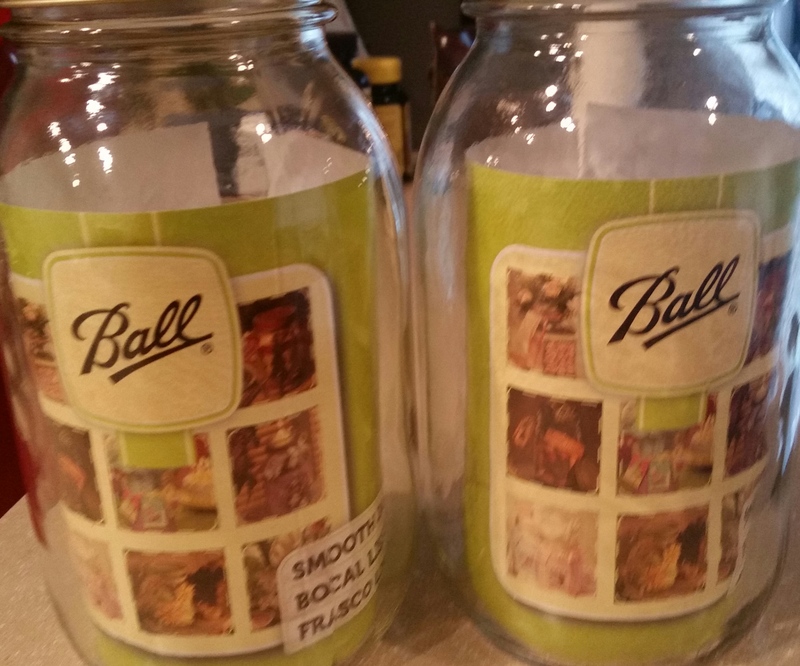 You can find these jars in the canning section of most stores. 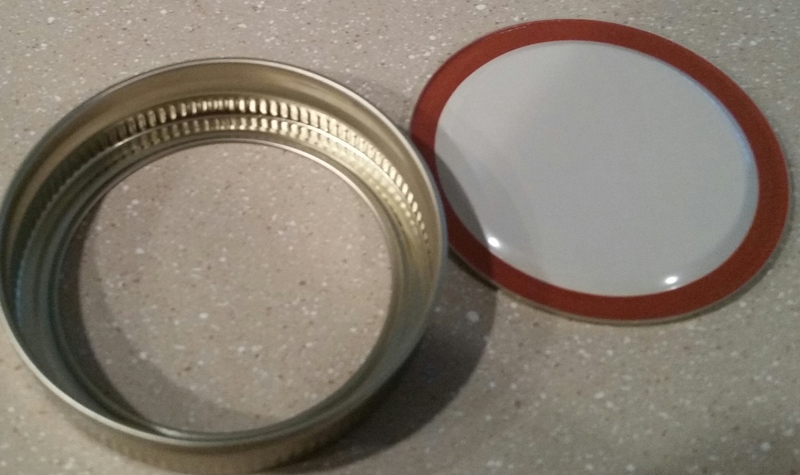 Most mason jars have canning lids. I don’t like these because they rust after a few weeks of using and washing them. 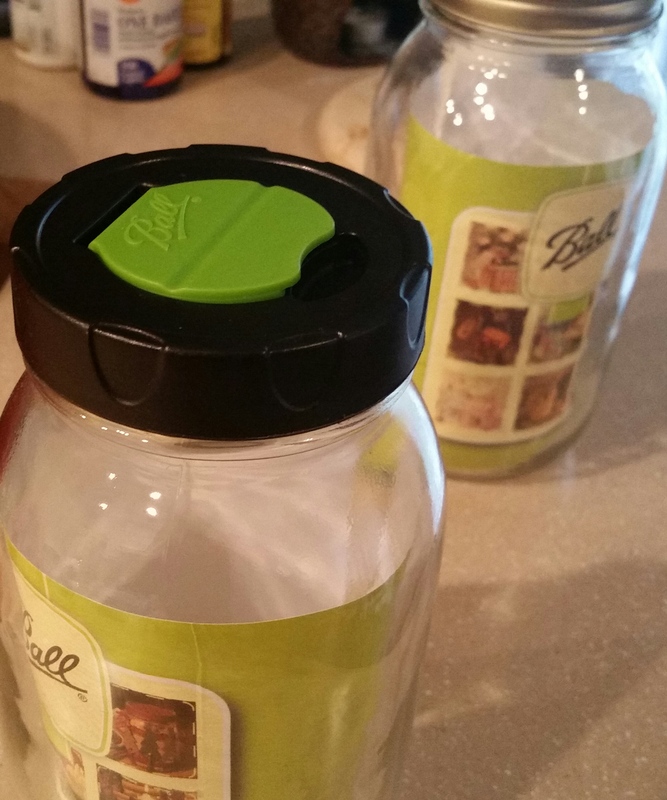 I also tried using old dill pickle jars because they have a wide top. I had a rusting issue with them as well. My solution was to buy these. 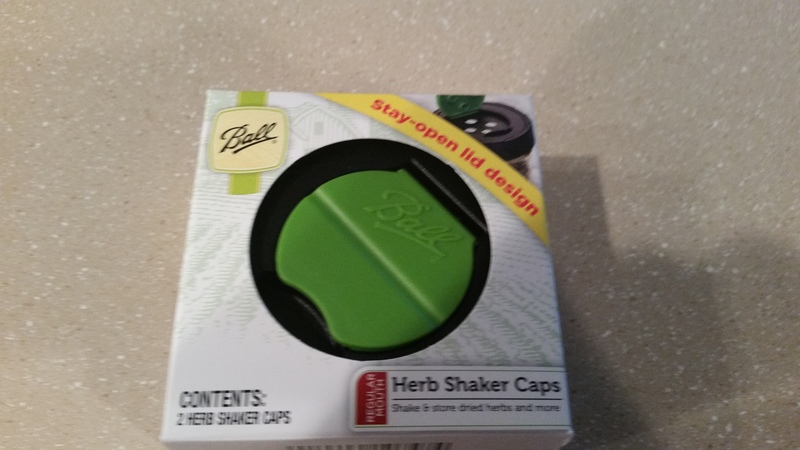 They’re herb shaker caps that don’t rust. Unfortunately, they only fit on mason jars with narrow tops. What do I put in the salad? 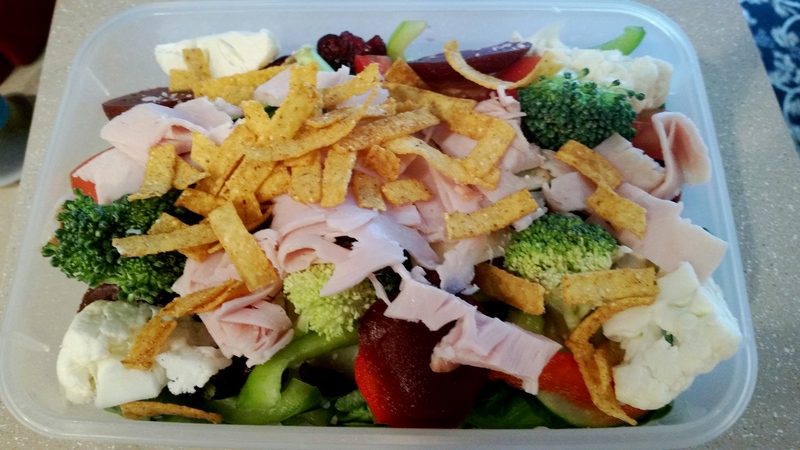 You can make the salad as grand or as simple as you like. I prefer to put lots of ingredients in mine. 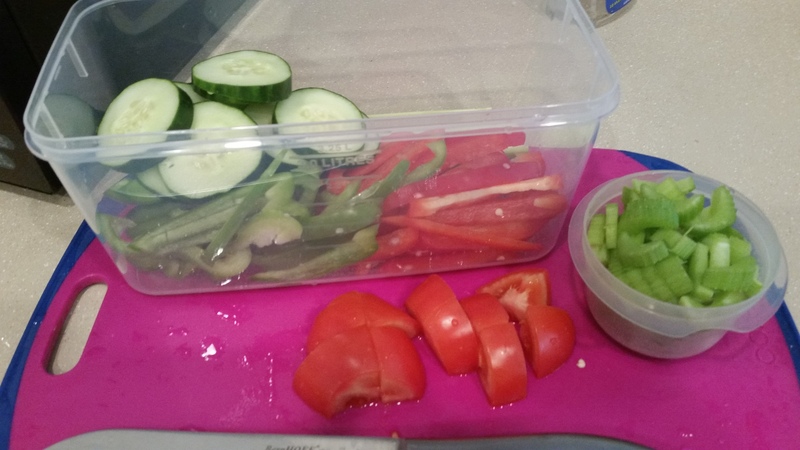 I eat a lot of vegetables during the week and I prep them on Sunday, putting some in my salads and the rest to in a container to use later in the week. 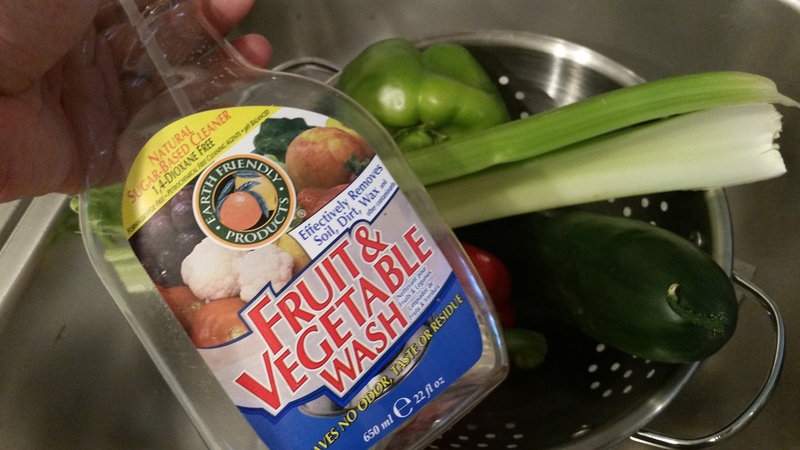 I wash my veggies with a sugar based wash and then I slice and dice. 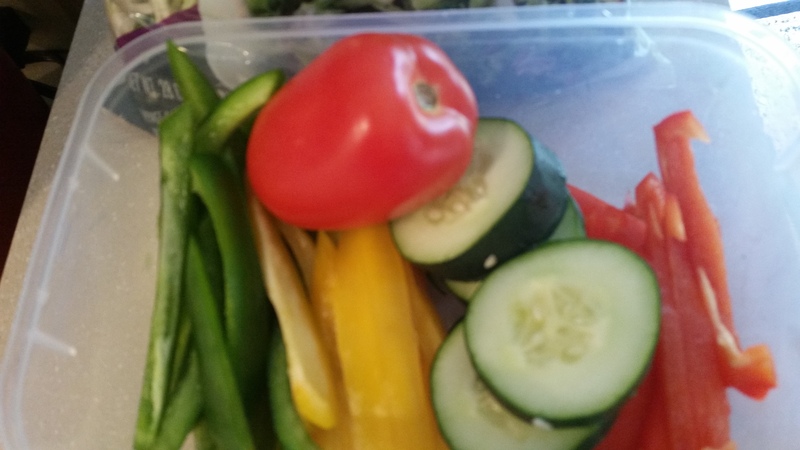 I use these vegetables in smoothies and in other meals throughout the week, so prepping everything on the weekend saves me time. After you do this for a few weeks, you’ll sail right through the prepping process. This is how I store the veggies. I layer them in the container and put a paper towel on top. 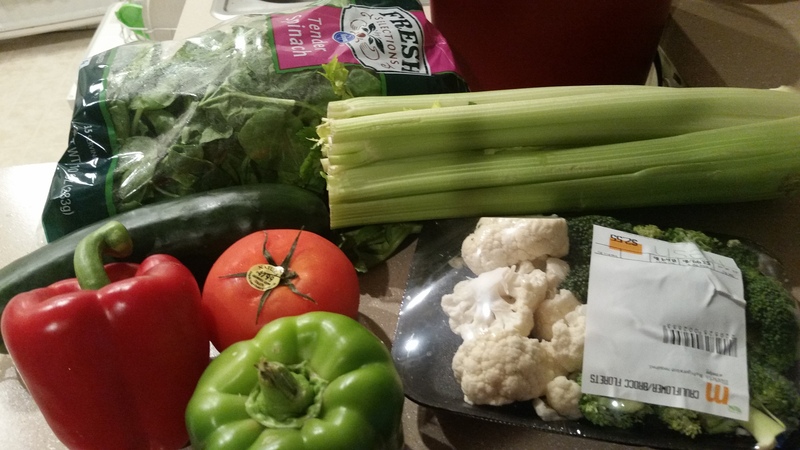 The towel absorbs the moisture and keeps the veggies crisp. It works with lettuce as well. 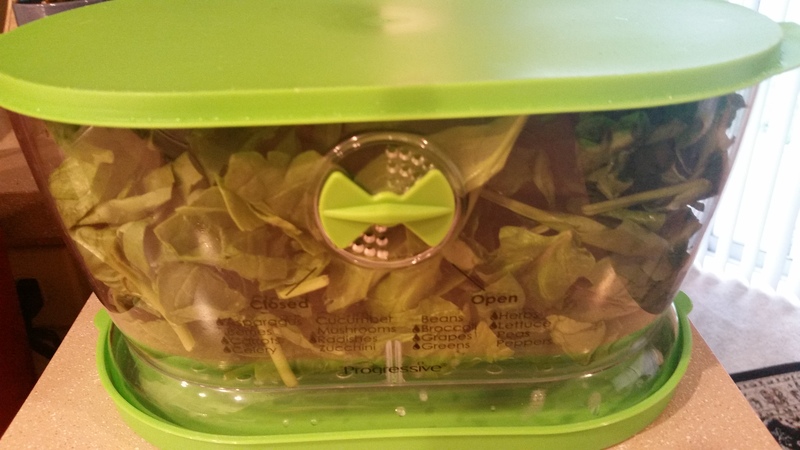 I prefer to use spinach most weeks which I keep in this lettuce keeper that I purchased at the Container Store. Some weeks I add this Kale and cabbage mixture to pump up the taste of my salad. It comes with a poppy-seed salad dressing, cranberries and nuts. I purchase this from Costco for $5. Here are some other ingredients I like to add. You can also add carrots, garbanzo beans, squash etc. In fact, you don’t have to add lettuce at all. 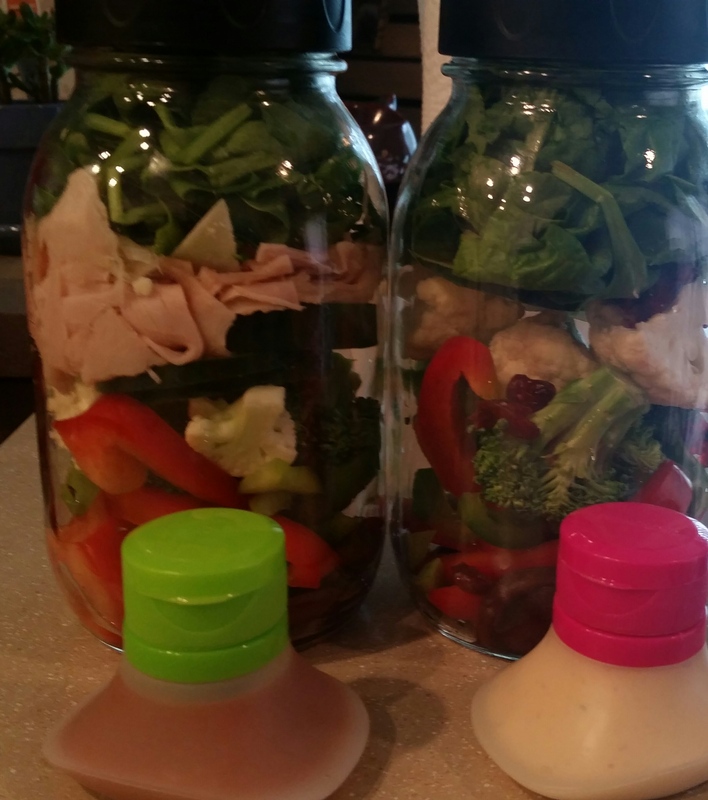 Whatever “salad” you want to create will stay fresh in the mason jar. I’m using sliced deli turkey and tuna as my protein this week, but I often make vegetarian salads. How does the salad stay crisp? The trick is in the layering of the ingredients. The basic rule of thumb is to put the wet items at the bottom and the dry items on top. 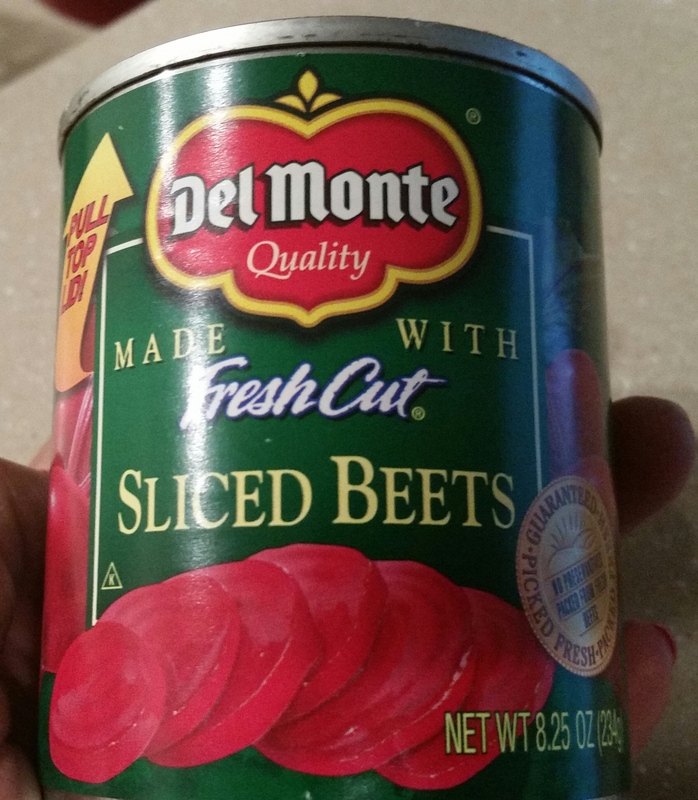 As you can, I have the beets on the bottom. I layer the celery next, although the beet juice seeps into the celery. It doesn’t bother me, but you could choose to layer the bell peppers on top of the beets. After the peppers comes the cauliflower, broccoli and cucumber. I layer the meat next and then the cheese and cranberries. The lettuce is always last. 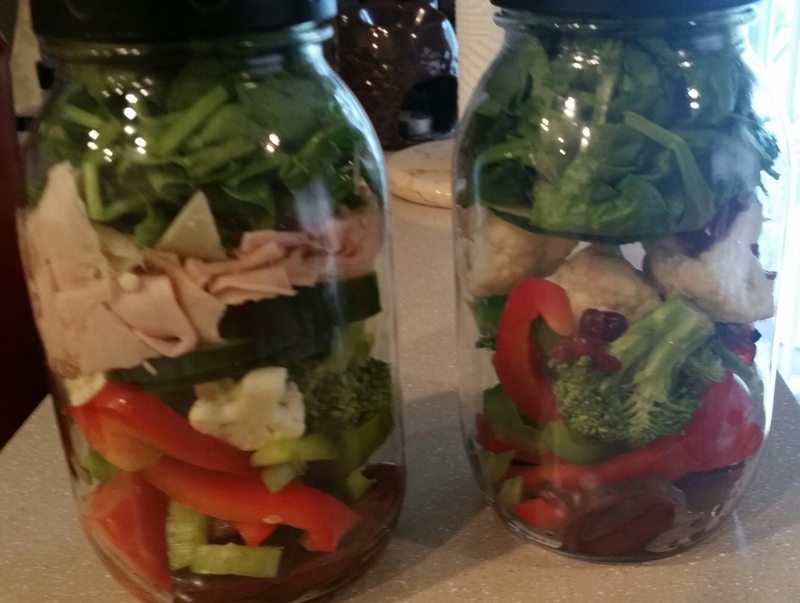 If you look at the second jar, I didn’t put the tuna in the salad. 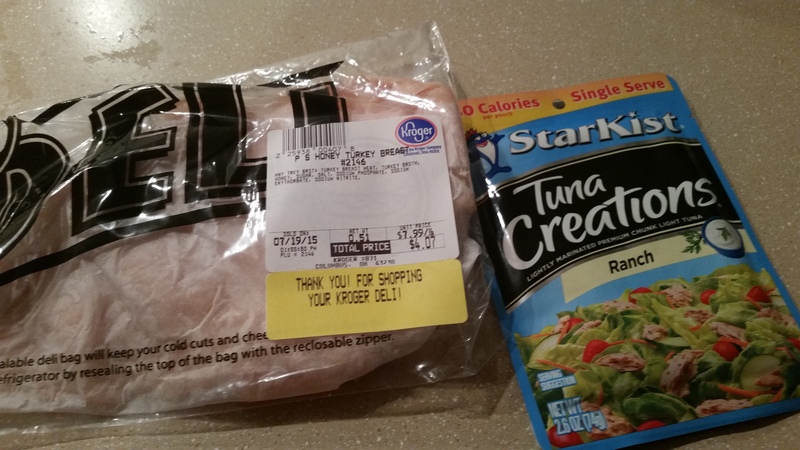 I prefer to keep the tuna package separate and add it when I eat the salad. I also put the tortilla strips in a small bag to make sure they stay crispy. I feel like the salad dressing loses some of its flavor after sitting at the bottom of the mason jar for several days, so I’ve started adding it separately. 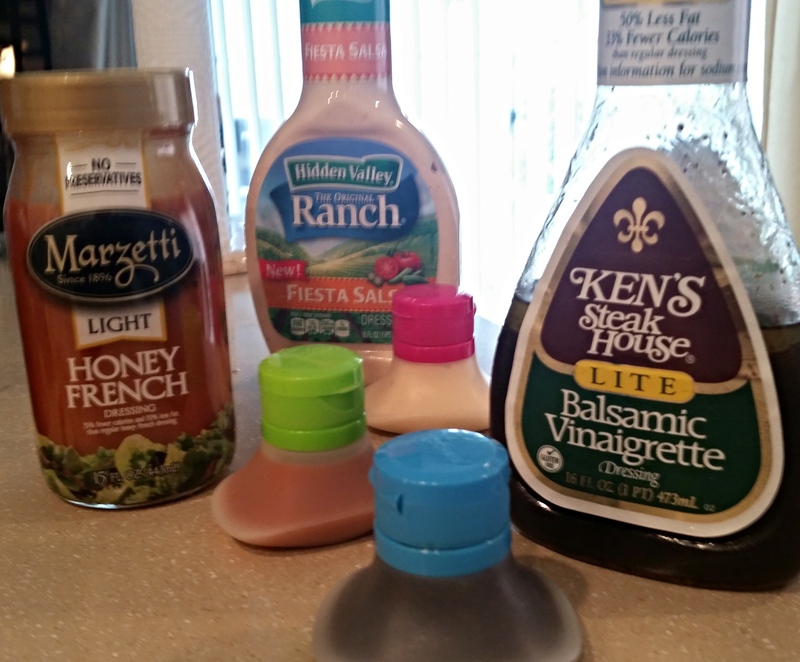 I pour it in these little dressing containers, so that I can grab the type of dressing I’m feeling that day. If I put it in the bottom of the mason jar, I’m committed to a specific dressing even if I don’t want it. 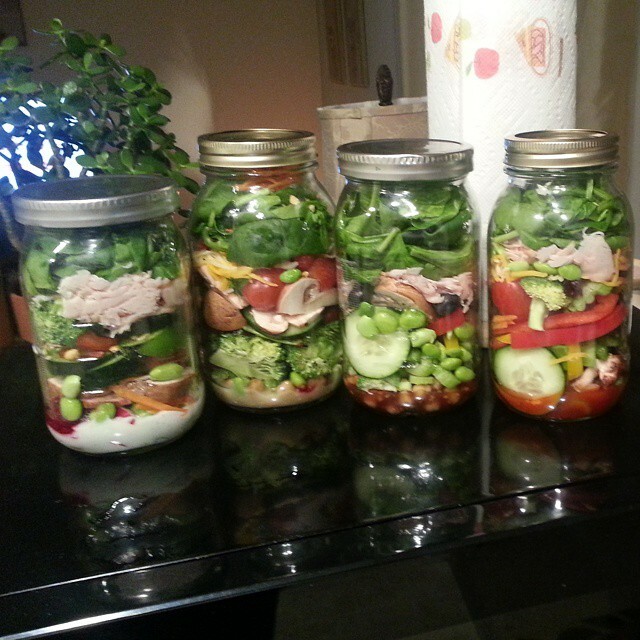 So now my salads are ready for the refrigerator, and they will be good until the end of the week. When you eat the salad, just pour it out on a paper plate. The lettuce will be on the bottom and the rest of the ingredients will spill out on top. Here’s what I put together for Monday. A delicious lunch ready to go and two more ready for later in the week. It took forty minutes to prep everything and make the salads. Let me know if this helps out or if you have any salad in a jar recipes of your own.